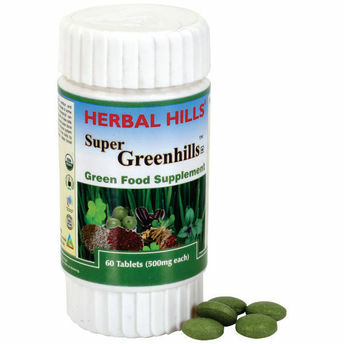 Super Greenhills contains an assortment of nutrient rich food such as Wheatgrass, Barley grass, Alfalfa, Spirulina, flax seeds, Sesame seeds, sunflower seeds designed as nutrition support to your daily diet. Alfalfa besides being rich in nutrition, it is also known to help in regulating the bowel movements and improving the digestion process which in turn helps in the better assimilation of the food consumed. Spirulina contains beta-carotene, as well as chlorophyll and the essential fatty acid GLA. Phycocyanin, its phytonutrient, has been shown in animal studies to stimulate the production of red blood cells. An excellent combination for daily nutritional requirement. Provides essential micronutrients. Helps to boost immunity which makes the body stronger to fight against infections.